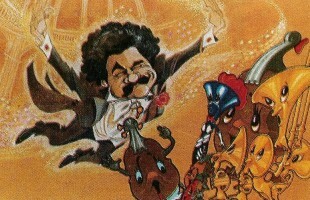 The screenplay of The Enchanted Orchestra was written in 1979, based on the story by Barry O'Keef. Armstrong had first met producer, O'Keef in April 1977 when commissioned to write 12 half hour dramatised fairy tales for his company, Maiden Music Ltd; a company specialising in producing children's records. By the end of the year, Armstrong had dropped his plans to move to America and joined O'Keef's company, ostensibly to help him create a film division but also to work alongside him developing a variety of projects. One of the projects was The Enchanted Orchestra. Inspired by Sparky's Magic Piano and Tubby The Tuba, O'Keef had written it to be his most ambitious children's record to date. Armstrong helped him cast some of the voices for the album but O'Keef wanted a major star for the Storyteller. The script was sent to James Mason via a contact of Armstrong but Mason declined the role. Concerned that the quality of his writing was insufficient, O'Keef asked Armstrong to completely rewrite the Storyteller's opening and closing narration. Having done so, Armstrong set up a lunch with ICM agency head, Dennis Sellinger to discuss the possibility of David Niven taking on the role. Sellinger loved the project and the script now with the new Storyteller's narration and so it was sent to Niven. With the cast tracks, apart from the narration, already recorded, O'Keef went into de Lane Lea recording studios on the 24th February 1978 to record the orchestral tracks with arranger and conductor, Arthur Greenslade and composer, Max Early, O'Keef's nineteen year old protégé. On the 19th April, David Niven agreed to play the part of the Storyteller and recorded the narration in an Antibes studio on May 5th. As O'Keef started mixing the tracks, his in-house artist, Neil Grimshaw began finalising designs for the album, which would contain a 16-page book of the text, full colour illustrations and a specially arranged piano score of the main theme. Throughout the remainder of the year, attempts to secure a realistic deal from a major distributor received little enthusiasm. As a consequence, O'Keef finally decided he would release it under his own label in the U.K. For Holland, a big market for children's product, the Dutch release was signed over to Theo de Vos of Ring Workshop in Hilversum with whom O'Keef had developed a close working relationship. As work was nearing completion on the album early in 1979 in readiness for its release, Theo de Vos was approached by an international lawyer, G.A. Dolk, who was putting together a consortium of top Swiss lawyers, economists, financiers and medical specialists including Dr Bruno Becchio, Dr Bellward, leading ENT specialist Dr Hugo Grandi and leading architect Dip. Hardi Holler. The consortium, with Swiss government assistance, was to head a mammoth new world medical centre in conjunction with the World Health Organisation for medical research, education and the arts to be based in Leuk, Switzerland. This giant Leuk Foundation Centre would be divided into two sections: the Leuk Medical Centre and the Leuk Creative Arts Centre. With the people who would head the Medical Centre already on board, de Vos and his Ring Studios were offered the opportunity to head the Arts Centre. While showing Dolk some of his current product, de Vos, mentioned his U.K. connection with O'Keef, which prompted a playing of The Enchanted Orchestra tapes. Dolk's reaction was to enquire why this was not being made into a feature film. Immediately, de Vos contacted O'Keef, to discuss the possibility. O'Keef was well aware that, in itself, his album script was insufficient to turn into a full-length animated feature film. Its running time alone was barely half what would be required - plus it had been written for the very young. Not wishing to lose the opportunity, however, he asked Armstrong to look at it. The first thing Armstrong had to do was come up with a device which would expand the simple story into something far more universal and sustainable. There was also very little time before the proposed meeting with Dolk. It was during a discussion with the album's designer and fellow Disney fan, Neil Grimshaw, that the idea of turning it into another Fantasia presented itself. It meant that the instruments would now not only play their own tunes but also play those of great composers - each piece being separately illustrated and introduced by their respective ghostly creator. Unfortunately, it meant there was little time for the classical pieces to be chosen and creative decisions made on how best they could be illustrated. 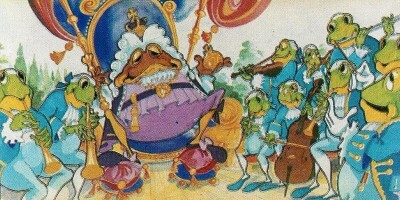 A few quickly sprang to the fore: Baba Yaga's hut on fowl's legs from Mussorgsky's Pictures At An Exhibition; an amphibian, fish and insect vision of Handel's Water Music - mainly because of the company's Toad's Army albums; an Egyptian mythological fantasy for Verdi's Grand March from Aida; Druids at Stonehenge for the 2nd movement of Beethoven's 7th Symphony; an aerial ballet of hot balloons to Elgar's Chanson de Matin; Wagner's Ride Of The Valkyries (at that time, conceived as a grim sequence akin to that of Fantasia's Night On Bare Mountain) and a Viennese ball of bats for Strauss's Overture to Die Fledermaus. Other possibilities toyed with were Tchaikovsky's Swan Lake (The Nutcracker and Sleeping Beauty had already been used by Disney) Rimsky-Korsakov's Scheherazade; the Rossini/Respighi La Boutique Fantastique; Mendelssohn's Overture to A Midsummer Night's Dream (rejected as being too similar to Fantasia's Nutcracker sequence); Grieg's Peer Gynt Suite (rejected because of its use in Song Of Norway); Saint-Saëns' Carnival Of The Animals, and countless others. Armstrong also concluded that a live-action backstory was needed for Peter, to strengthen and give greater meaning to the long animated dream sequence. On July 8th, Armstrong and O'Keef flew to Amsterdam for the meeting which de Vos had organised with Dolk and his associates. On July 9th, they sat before the gathered Board. Playing extracts of the chosen musical pieces and giving very generalised descriptions as to how they would be depicted, Armstrong and O'Keef outlined a lavish half live-action, half-animated feature film to be shot in 70mm (only two companies had ever attempted this: Disney with Sleeping Beauty and Richard Williams with his forever ongoing The Cobbler And The Princess). The intended film would have a glittering array of star musical talent and star acting talent. They then informed the committee of their requirements to prepare such a package for financing. The meeting concluded with a heavy question and answer session. On July 10th, Dolk confirmed that the Leuk Foundation would not only put up immediate development money but - subject to a successful presentation of the developed project - provide whatever money was needed to make the film. On July 11th, back in London, O'Keef received yet further confirmation and instruction from Dolk after which the album's illustrator, Neil Grimshaw, was appointed Head of Design for the project and Armstrong designated writer and director. The arrival of development money, as promised, from the Leuk Foundation, signalled O'Keef's company to begin the huge job of preparing a full presentation pack for the Leuk committee to assess and make their final decision about financing the film. This pack was to include: animation designs, artwork and vision boards, detailed budgets, bridging budgets, break-downs and projected schedules, tapes of the original music and album with publicity schedules and a completed screenplay. At the time, Armstrong was in the middle of writing a script for BBC's Shoestring, as well as trying to find end money for his intended spoof film musical, The Curse Of Tittikhamon scheduled for autumn pre-production. 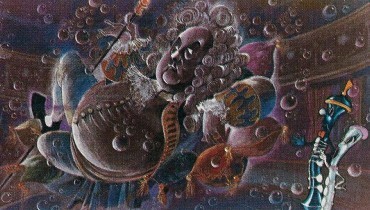 Despite these commitments, on July 30th, Armstrong turned his attention to the screenplay for The Enchanted Orchestra. He decided to place the story in a definable setting such as the Royal Albert Hall - a decision that led to the exciting discovery that there had actually been a Gala Concert there on May 26th 1932 attended by King George V and Queen Mary. Sponsored by the News Chronicle, this World Celebrity Concert in aid of the Musicians Benevolent Fund had included legendary artistes such as violinist, Fritz Kreisler, singers John McCormack, Florence Austral, Friedrich Schorr and Elena Gerhardt, cellist Guilhermina Suggia, pianist Wilhelm Backhaus and conductors Sir Henry Wood, Adrian Boult (at that time unknighted) and Sir Edward Elgar conducting his Pomp And Circumstance March No 1 in D. This now placed the story in the 1930's, which immediately introduced a style, sophistication and whole new social and political depth to the setting and its characters. As researchers set to work providing Armstrong with information on the period and, in particular, the concert, he finalised his search with Grimshaw and Early for the pieces they would be using. In keeping with the album, it was decided to retain the Brahms 2nd Piano Concerto for the film's credit sequence. In the composer's line-up, the serious absence of Mozart was rectified by including the opening movement of his 40th Symphony as the piece Sir Arthur Granville conducts at the concert which Peter sneaks in to watch. In reality, the piece was not performed at the actual 1932 concert but as Granville was a fictional character anyway, it was felt dramatic license was allowed. The structural need for a strong dramatic piece and the noticeable absence of Tchaikovsky led to the inclusion of his 6th Symphony and the depiction of Pompeii. 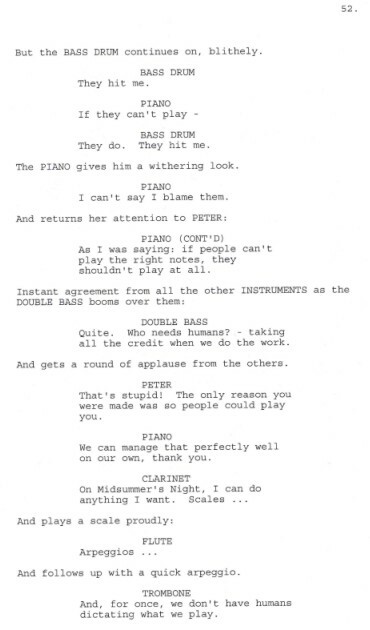 This immediately had a knock-on effect on the Wagner, which didn't take much thought to tip it over into comedy. 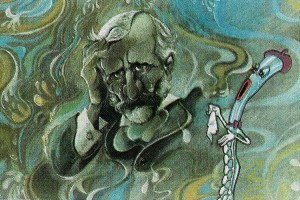 The Humming Chorus from Puccini's Madama Butterfly was a last minute substitution after the loss of Elgar's Chanson de Matin when it was discovered he could hardly appear as a ghost because, not only was he still alive at the time but was actually one of the guest conductors at the 1932 concert. By September, virtually everything else on Maiden Music's schedule had been put on hold - including The Curse Of Tittikhamon. Circumstantially, a BBC Man Alive documentary unit had been filming its struggle to raise end finance as a perfect example of the British film industry's continual problems attracting investment. The go-ahead for The Enchanted Orchestra ironically provided them an unexpected ‘feel-good ending' to their report. Throughout October, Armstrong locked himself away to write the screenplay, emerging only to provide Grimshaw with information for the design boards as he wrote the scenes they would illustrate. To ease his workload, Grimshaw had invited an ex-colleague, artist and cartoonist, Robert Gibson to work with him. He and Gibson divided the design boards between them: Gibson taking the ghosts and pieces by Mussorgsky and Tchaikovsky; Grimshaw re-examining his design of the instruments and taking on the pieces by Puccini, Beethoven, Handel and Verdi. The Strauss was split between the two of them. By courtesy of the Disney Company, the creative team were treated to screenings of the entire Disney catalogue of animated features in order to study animation techniques. "One morning, without thinking, we foolishly sat down to watch a double-bill of Bambi followed immediately by Dumbo. You should have heard the sobbing!" Armstrong recalls. "Worse, in the pub afterwards, everyone kept staring at us - there we were, this small group of grown men all with red eyes from having cried so much!" On November 5th 1979, Armstrong's completed screenplay went to the printers. If the animated dream sequence was going to be spectacular - especially the destruction of Pompeii in 70mm and the bats' Viennese Ball - the live-action sequence now boasted its own spectacle: large crowd scenes of the 30's Hunger Marches and, in the Royal Albert Hall, a spectacular recreation of the 1932 Royal Gala Concert to be topped by the film's ending at a modern "Last night at the Proms" Promenade Concert - both recreations involving thousands of extras. By the end of November, completed packages had been sent to each of the Leuk committee members individually. Each package contained a bound copy of the full screenplay, a complete set of full-colour vision boards, full budgets and schedules, set breakdown, shooting schedules, original music scores, audio cassettes of the classical music being used, a list of projected stars, crew and musical artistes, a letter of agreement with Bray Studios for construction of the huge multiplane camera attachment required for shooting animation in 70mm, publicity schedules for the album release together with posters and advertising, a copy of the album signed by David Niven - all neatly packed into a lightweight compact attaché case. A rapid response to the package, from Dolk, confirmed that the film was to go ahead and that bridging money would be forthcoming to cover the first stage of work needing to be done before the official start of pre-production. Over the next couple of weeks, the Leuk Foundation's continued enthusiasm for the film led to a series of further meetings with de Vos and O'Keef, including one in Leuk itself where the Mayor and entire town turned out to greet them and play host. It ended with O'Keef and de Vos being asked to head the Leuk Creative Arts Centre and create a top world centre for all the Arts: music, art and crafts, opera, theatre and film and recording studios. Schedules were now sent to Dolk stating specifically how much money was needed for each stage of the film's creation: December 1st had been scheduled for the commencement of storyboarding, crewing, studio conversion, contractual commitments, deposits on equipment etc. 8th January 1980 had been designated as the commencement of pre-production for the live-action sequences and commencement of testing and pre-production for the animation sequences. July 21st was to be the first day of principle photography for the live-action sequences. Shooting was scheduled for 12 weeks. October 13th was the start of post-production for the live action sequences. 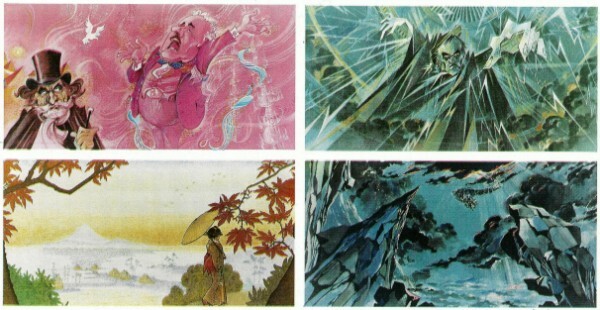 January 1981 was the date to start work on the animation sequences for a two-year period. Dolk acknowledged the received schedule and reassured O'Keef there would be no problems. At the end of 1979, Maiden Music moved into spacious new offices off the Aldwych, to start work on the film in earnest - even though the requested bridging money had not yet arrived. This had been required to cover development costs up to the official pre-production date of January 8th when the film's first major monies were due. Armstrong started exploring the new digital technology which he wished to apply to film for the first time, combining it with animation and opticals to create a completely new and unique visual experience for the audience when the instruments performed the Early piece. 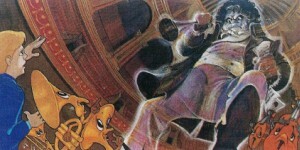 At the same time, Grimshaw was busy designing sets for the live action segment which would correspond with the animation scenes, while Gibson was at work creating characters and visual ideas for some of the classical music sequences. In this sequence, the accident-prone bear had been nicknamed Gus due to Gibson basing him on one of the animation co-ordinators. Likewise, Baba Yaga was drawn from Anna Quayle and, for the Aida sequence, an Egyptian appearance by Uncle Henry had been modelled on Roy Kinnear. Meanwhile, Associate Producer, Christopher Sutton, had set about crewing, starting with Oscar winning veteran Jack Hildyard agreeing to be Director of Photography. Amongst Hildyard's 60+ credits were David Lean's The Bridge On The River Kwai and Hobson's Choice, Anastasia, The Yellow Rolls Royce, The VIPs, Battle Of The Bulge and Hitchcock's Topaz. Music adviser, Ates Orga started negotiations for Vladimir Ashkenazy to appear as the concert pianist at the end Prom. Riccardo Muti, George Solti and Andre Previn were just three of the top international conductors being considered to conduct the score. For the operatic sequences, initial approaches were being made to Luciano Pavarotti and Joan Sutherland. On the casting front, Paul Scofield was proposed for Sir Arthur Granville. Deborah Kerr turned down the role of his wife, allegedly because "she actively hated these kind of films with children". Luckily, this was not expected to be Audrey Hepburn's response. Other names being considered were Judi Dench for Nanny and Armstrong favourites, Roy Kinnear and Anna Quayle for whom he had written Uncle Henry and Miss Grisby, respectively. David Niven had already expressed a wish to recreate his Storyteller's role from the album and appeared with Armstrong on a BBC Nationwide programme hosted by Sue Lawley to launch the nationwide search for the little boy who would play Peter in the forthcoming £25,000,000 film - at that time being one of the most expensive and elaborate European films ever. Within moments of Niven and Armstrong's appearance on Nationwide, phone-lines at the BBC were jammed as were those at Maiden Music. 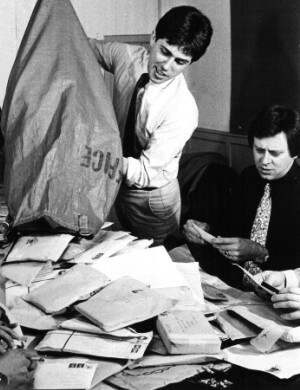 A few days later, Bray Studios had a sound stage piled high with mailbags containing prospective Peters. An advance team finally narrowed them down to a mere 100,000 credible entries for Armstrong to consider. "Some of the rejects they showed me were extraordinary," he recalls, "Every age, shape and size you could imagine. I remember one photograph of an entire family - I think they were Turkish - they all looked extremely happy, extremely fat and all had moustaches: father, mother, uncles, aunts, sons, daughters, grannies - even the baby looked suspiciously dark above the upper lip. The most poignant, though, was from a grandmother writing a long and beautifully written letter to accompany her grandson's entry, explaining that his greatest passion was music and how it would mean so much to him if he could get the part...and he was blind. We wrote a letter back to her, explaining that, even had he been suitable, his handicap - for safety reasons, alone - would have prevented him being given the role. However, there was no reason why it should prevent him pursuing his great love of music. We sent her a complimentary copy of the album and several others that Maiden had produced and promised her we would invite them on set to meet the stars and to hear the music being recorded at a later date if they so wished." To apply for the role was not simple. Applicants had been asked to supply current photographs: head and shoulders and full length, personal details: height, age etc. experience and a voice tape - preferably from the script available in the album of The Enchanted Orchestra about to appear in record shops throughout the country. 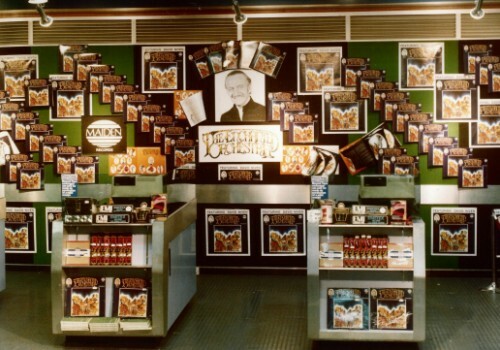 This information was being broadcast nightly on Nationwide backed by a costly publicity campaign to promote the album, with advertising on public transport together with shop displays, including a full front window and one whole side of the store at HMV in Oxford Street. Plus a Radio 4 broadcast of the album and just about every newspaper in the country reporting on the film and the search for the boy who would play Peter. 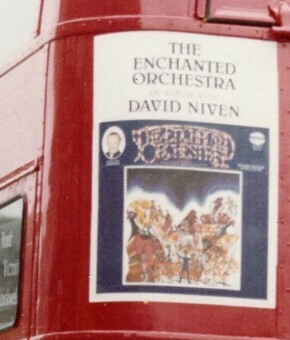 All this during the December build-up to Christmas should have sent sales of the newly released album of The Enchanted Orchestra through the roof. Unfortunately, O'Keef learnt too late that - other than a sample few thousand - pressing of the majority of albums would not be completed until well after the Christmas period and the entire publicity campaign was over. Throughout the autumn and winter months, O'Keef had been relying on the Christmas album sales to ease Maiden Music's debts. Now, his company was totally reliant on the monies from the film to ease serious cash flow problems. To add to his worries, only a tiny fraction of the bridging money for the film had actually arrived. Armstrong and associate producer Sutton, however, were far more concerned about what would happen if production monies were not in the film's bank account by January 8th - the first day of official pre-production when hundred of thousands of pounds would need to be immediately available. At O'Keef's request, Armstrong phoned Dolk. This was not the first time Armstrong had been asked to deal with him over concerns. When initial press releases about the film and the Leuk Foundation had caused many raised eyebrows, Quentin Falk of the trade magazine, Screen International had phoned Armstrong, personally, to check on its legitimacy. Armstrong concurred with Falk that it all seemed too good to be true and had referred him directly to Dolk. The resultant conversation between the two men had apparently satisfied Falk sufficiently to go ahead and break the news in the press. A second call from Armstrong to Dolk had been at the beginning of December when bridging money had not appeared on the scheduled date. He had warned Dolk that a film was like a snowball rolling down a slope. Once started, there would be no stopping it. Any delay in monies not being available when required, on a film of this scale, would be catastrophic. Dolk had reassured him there would be no further delays and gave Armstrong his personal assurance that there were absolutely no problems concerning the finance and that the film was to go ahead. This third time when Armstrong phoned, Dolk was unavailable. He was unavailable throughout the rest of the day each time either Armstrong or O'Keef phoned. O'Keef, Armstrong and Sutton were now seriously worried. They were surrounded by a barrage of publicity, press coverage and frenzied activity from a rapidly expanding workforce. If pre-production monies were not made available on January 8th, resultant problems would, at the best, mean a delay in shooting - instantly pushing the film way over its budget by millions of dollars. And, at the worst, the whole pack of cards would be brought tumbling down, wiping out O'Keef and his entire business in the process. O'Keef hastily informed de Vos of the impending disaster facing them both, and together they set about trying to locate Dolk and contact the Leuk Foundation. Armstrong and Sutton returned to working on the film, allaying any suspicions of front office problems and applying brakes to slow the production down wherever it might incur further expenditure. The 8th January deadline for official pre-production arrived. Dolk was still unobtainable and no monies had appeared. They did, however, engender a brief visit to London by one of the Leuk committee, Bruno Becchio. Seeing for himself, the reality of the problem, Becchio offered further assurances that the money would be forthcoming subject to a short delay. With the publicity machine still at full throttle, work on the film continued, albeit slowly and in restricted areas - funded solely now by hugely increasing bank loans and other borrowings by O'Keef and de Vos. Now, despite Sutton's every effort to put a hold on expenditure, each succeeding day was bringing in bills from the previous year that should have been covered by the bridging monies. Many of these were threatening legal action. To make matters worse, a couple of unpaid crew salaries had set rumours flying. A desperate call was placed to Becchio, requesting an urgent meeting with those individual members of the Leuk committee who had originally sanctioned the project under Dolk. Becchio promised he would attempt to arrange it. Leaving Armstrong and Sutton to hold the fort, O'Keef left on January 7th for the Midem Festival at Cannes; it being the annual international buyers and seller's marketplace for the music business. He had barely left before the all-powerful film union, the ACCT (now BECTU) were on the phone demanding an immediate meeting to explain what was happening with the film and why certain members' salaries were unpaid. An urgent call to O'Keef failed to convince him that his return to meet the union was imperative even though the ACCT had the power not only to shut down the film immediately but also blacklist the company and its producers. His instruction was for Armstrong and Sutton to attend on his behalf. Fortunately, both Armstrong and Sutton were in excellent standing with the union (Armstrong had even sat on the writer's committee for several years). They explained as much as they knew of events and O'Keef's situation with the Leuk Foundation and their confidence that the unpaid members' salaries would be honoured the following week. Having diffused the union situation, the problem now was to ensure that O'Keef returned from Midem with a cheque sufficient to clear, at the very least, the unpaid salaries. Armstrong and Sutton knew that, even if O'Keef succeeded in getting the money, it would almost certainly now involve re-scheduling the live-action shooting, thereby putting the film way over its original budget. Learning from O'Keef that the Leuk committee members had been invited to a meeting in Cannes the following Monday on January 21st, Armstrong decided to take no chances and caught the next plane to France. He arrived to be swept into a blaze of publicity and an organised press conference for the film at the Press Club, Malmaison. From 12.30 till 1.00 he sat next to O'Keef extolling the wonders of the project to the world press. That evening, the committee of internationally renowned doctors due to head the Leuk Medical Centre sat opposite O'Keef and de Vos due to head the Leuk Arts Centre at dinner in a Cannes restaurant. Armstrong was present. Dolk was not. "The whole evening was unreal," Armstrong recalls, "It was like some terrible bad joke. The doctors - nice men and, I'm sure, honourable men - seemed as confused by events as Barry (O'Keef) and Theo (de Vos). Apparently, the development money Barry had received at the beginning had come from them, personally, not the Leuk Foundation. They'd also - the Medical Centre fraternity and the Arts Centre fraternity - both thought it was the other who was the basis of the Leuk enterprise. The whole thing got worse because no one there had anything like the kind of money needed to get the film off the hook, never mind fund it. I must say, at that particular point of time the last thing I was interested in was who'd thought what - or Dolk's whereabouts or - whatever. All I knew was there was no way I was going to fly back to London without a cheque for the union to cover those unpaid salaries. I didn't care who it came from just as long as I went back with it safely in my pocket - not forwarded, not posted, not a bank transfer - but actually in my pocket!...I remember putting the fear of God into them all, trying to ram home the seriousness of the situation. I also ended up footing the bill because Barry hadn't got any money - a bill for twelve people! - at a top restaurant! - in Cannes! - at the height of the Midem Festival! But I did head back with a cheque to pay the salaries!" Back in London, news of the catastrophe was revealed only to Sutton and O'Keef's staff. Grimshaw, Gibson and Early, philosophically, carried on working in the hope that it would not prove a waste of time in the long run. Fortunately, there was little media or industry reaction when it was announced that, due to the scale of the project, shooting was to be delayed. Likewise, because of Armstrong and Sutton having put brakes on the production, enquiries concerning stars and musical artistes had been allowed to go no further than availability checks. No major contracts or commitments had been signed and most creditors bowed out, gracefully, knowing the all too familiar "one minute it's all happening, the next it's all off, now it's happening again, now it's all off " scenarios so frequent in the film industry. As Armstrong points out, "Producers and production houses live such precarious lives because, however careful they are and whatever precautions they may take legally, they're forever at the whim of their investment sources. I've known of so many instances where productions have started up in good faith only for one of the backers to withdraw suddenly and without warning. And there's nothing you can do about it. And down comes the pack of cards with everyone in it. And it's the producer who ends up getting the blame." Meanwhile, as the film was grinding to a halt, what had been intended to be a spectacular star-studded televised Royal Gala Charity Concert for Save the Children, had killed off its every opportunity to be a high profile event due to administrative ineptitude. Fortunately, the performance, itself, despite front office bungling, proved to be a huge success with the audience. It had even survived an attempt by the Swiss medical group's lawyers to take out an injunction to prevent it happening unless, amongst other things, the development money they had invested in the film was returned. The concert had only gone ahead because an angry Armstrong had threatened them with exposure in the press if they tried to stop it. The concert more or less heralded the end of The Enchanted Orchestra project. In two desperate efforts to revive it, O'Keef took the package to Disney but came back empty-handed. Even interest by Stan Lee of Marvel Comics came to nothing. He had read about the project in an article about Armstrong by Alan Jones in Starbust magazine and contacted the Maiden office to enquire about the film's progress. "Quite what happened, I don't know," Armstrong recalls. "Stan Lee called me and was so enthusiastic about what he'd read and some of the artwork featured in the article. I put him onto Barry (O'Keef) and Barry flew over to meet him. Then, somehow it all cooled. I suspect it may have been because of all the in-fighting over copyrights which was going on at the time between Barry, Theo, the Swiss and God-knows-who else." The copyrights fight began within days of O'Keef having arrived back from Midem. 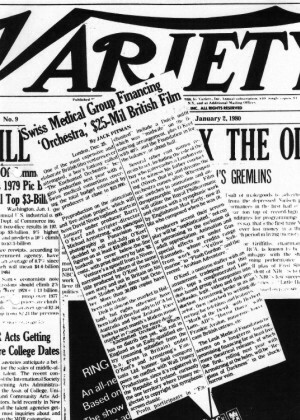 The Swiss doctors wanted something in return for their investment and claimed to own all rights to The Enchanted Orchestra. This proved to be far more complicated than they had ever imagined. Fights over who owned the album rights and in what capacities, were bad enough: the film was an even greater legal nightmare. Utter confusion developed over the ownership of the film's designs, character creations and illustrations - let alone those of the album. Similar disputes concerned the re-written scores by Early. The only unquestioned certainty was that Armstrong owned the screenplay. Because it had never been commissioned, contracted or paid for, it made him the major investor in the film's development budget. and, consequently, an investor in the film itself. "Of course," Armstrong points out, " the screenplay was still based on Barry's original album script so there was no way I could run with the script myself. The whole thing was a Mexican standoff. Nobody could do anything with anything. There was talk of fraudulent deception, there was talk of contracts between this party and that party and separate rights agreements over this and over that and covering different territories and different allocations of merchandising rights and book rights and audio rights and TV rights and...it was endless - and, ultimately, pointless because without the film actually being made, none of it was worth a penny." Throughout all of this, Dolk was noticeable by his absence. He continues, "To this day, I don't know the full details as to what the whole Leuk thing was really about, what was for real, what were just dreams or intentions ... I don't think anyone knows or ever will know now. Barry certainly wasn't naive enough simply to believe whatever he'd been told. He and I had numerous conversation about it and - really, the whole thing was so utterly incredible and even improbable - and yet, the people involved, the town of Leuk itself...when Barry described the reception he received and the mayor so excited about it all - and seeing the plans for the town's expansion to accommodate the new world medical and arts centre - and meeting the architect and - everything - and then, of course, the development money arriving as promptly as it did. However sceptical one was at the beginning, gradually the evidence seemed all too convincing. Besides, as so many of us reasoned, where was the gain for anyone if it wasn't true?" Although Armstrong's involvement was only with those areas directly affecting the film's creative side, he did hear various explanations as to why the money had never arrived and why Dolk had suddenly become impossible to contact. "One version I heard, from Barry," he recalls, "was that he'd been told - I don't know by whom - that this had been some great personal dream that Dolk was putting together and that the money was coming from the Shah of Persia. When the Shah was deposed, the new Iranian government had demanded his personal wealth and assets be returned to Iran. As it was all held in Swiss banks, the Swiss instantly froze the account - which, apparently, is what stopped the release of money not only for the film but the entire Leuk project. Barry speculated that, instead of letting everyone know immediately, Dolk had tried to save face by finding the money elsewhere and failed. If that was the case then my warning him what would happen if the money didn't arrive on time must really have got him worried, especially - if Barry's theory was true - the international press had found out." Although, as Armstrong adds, "Whatever the truth, there was certainly a lot more to the whole thing than had appeared on the surface because of what happened subsequently, several years later - which made one wonder exactly who'd been in cahoots with whom and who knew about things they said they didn't - or whatever...I've no idea - except that a wonderful idea sadly never happened." Adding to the mystery, Armstrong relates, as a post-script, "Some years after Barry's death, his widow Joan, Neil Grimshaw, Chris Sutton, Bob Gibson and I - all received individual calls from Theo de Vos asking to meet with us - separately - in London. I went to the Strand Palace Hotel and was shown into a suite to find Theo and Dolk sitting behind a desk, looking very nervous. They quizzed me to see if there was a way The Enchanted Orchestra film could be revived. I told them the simple truth: only with full consent of the original creative team and advance placement of finance in a bank account to cover the film's entire budget from start to finish. Joan, Neil and I, predictably swapped notes after our respective ‘interviews' where we'd all, apparently said more or less the same thing in no uncertain terms. Anyway, apart from a letter afterwards from Theo confirming they were trying to re-launch the project, none of us heard anymore about it so...who knows? - except, of all the projects I've ever been involved in, only one or two still hurt when I recall them - and The Enchanted Orchestra is one of them."